Tamboerskloof Guest House Cape Town CBD - Find & Book affordable Guesthouse Accommodation in Tamboerskloof, at Mountain Magic. 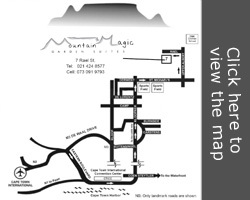 We are located in Tamboerskloof in the heart of the City Bowl next to the city's bustling attractions. The property and suites are surrounded by lush gardens and embraced by Table Mountain, one of the Seven Natural Wonders of the World. 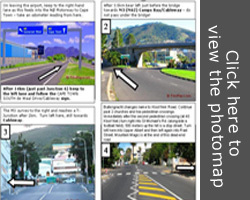 • You can walk to Kloof and Long Street shops, restaurants and cafes. You can see the cable car from our garden and drive or take a taxi (it's very uphill!) to the cable car station in 5 minutes. • The V&A Waterfront is a 5-7 minute drive/taxi and the beaches about ten minutes, that is if you don't stop in the Glen to smell the fresh pine forest scent. The Kirstenbosch Botanical Gardens for a walk or Sunday Concert, the vineyards and restaurants of Constantia are about 20 minute drive away as are the first towns of the Cape Peninsula. The vineyards and beautiful towns of Stellenbosch and Franschoek are a 45 minutes drive away.